High Quality Content by WIKIPEDIA articles! The Fox and the Hound is a 1981 animated film produced by Walt Disney Productions which premiered in the United States on July 10, 1981. 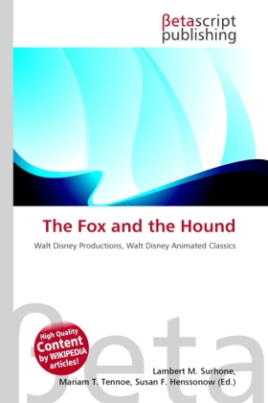 The twenty-fourth animated feature in the Walt Disney Animated Classics series, the film is loosely based on the Daniel P. Mannix novel of the same name and centers on the story of two unlikely friends, a hound dog and a red fox, who struggle to preserve their friendship despite their emerging instincts. At the time of release, it was the most expensive animated film produced, costing $12 million. It was the last "Walt Disney Animated Classics" movie to have no end credits, and the last Disney film in which Don Bluth was involved in its production. A midquel film, The Fox and the Hound 2, was released to DVD on December 12, 2006.